Val Kilmer and Elle Fanning star in this terrifying horror film written and directed by Academy Award Winner Francis Ford Coppola. Kilmer plays Hall Baltimore, a writer on a book tour who uncovers a disturbing murder that could be source material for his next novel. But as Hall investigates the killing, he finds himself confronted by chilling nightmares, including the ghost of a young girl (Fanning). As he uncovers more horrifying revelations, Hall will discover that the story has more to do with his own life than he could ever have imagined. After a 10-year absence, Francis Ford Coppola returned to the director’s chair with 2007’s Youth Without Youth. Since then, he’s been reasonably active, though it’d be hard for moviegoers to notice, as none of his releases made a splash. Youth generated a mere $239,000 during its extremely limited theatrical release, while 2009’s Tetro did marginally better with a US take of $416,000. 2011’s Twixt suffered the worst fate of all. Not only did it fail to get any form of US theatrical release, but also it appears to have stayed on the shelf for years. Twixt made the rounds at some 2011/2012 film festivals but that was about it until Fox finally put out this July 2013 home video release nearly two years after the movie’s September 2011 bow in Toronto. None of this inspires me with confidence, but the Coppola name intrigues me enough to give Twixt a whirl. B-level thriller writer Hall Baltimore (Val Kilmer) ends up in an odd small town called Swann Valley as part of a book-signing tour. Sheriff Bobby LaGrange (Bruce Dern) states that he can present Hall with a “doozy of a story” and shows him a dead girl impaled with a stake through her heart. LaGrange thinks this comes as the work of a serial killer and offers Hall the chance to collaborate with him on a book about the murders. Battling writer’s block, Hall takes a walk and meets a Goth girl named “V” (Elle Fanning). She leads him to the Chickering Hotel, an inn where Edgar Allan Poe once stayed. Hall encounters a mix of odd locals who lead him on a supernatural journey while he ponders how to come up with his next book. With a high level of amateurishness on display, I want to believe that Coppola intentionally “dumbed down” much of the production. I want to think he did this as a self-conscious homage to his early days at Roger Corman’s American International Pictures, the studio where he made the cheap horror flick Dementia 13. As much as I want to believe all this, I can’t. Instead, I think Coppola just made a crummy movie without any attempts to pay homage to his past. 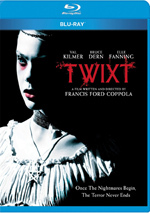 As I’ve not yet watched the Blu-ray’s extras, I don’t know how long Coppola spent on the production of Twixt. My guess would be the whole thing took roughly three weeks from conception to the end of production. It feels like Coppola thought up the idea, wrote the script in a couple of days, shot it over a week, and then wrapped it up within a brief period. I don’t think Twixt was intended as the direct-to-video project it became, but it feels like one. There’s just a cheapness at work here that makes Twixt resemble something made quickly to run on late-night cable. At its heart, I suppose Twixt has some promise as a supernatural horror flick, but it’s such a random, incoherent mess that it never goes anywhere. Coppola doesn’t tell a story; instead, he throws out vaguely connected narrative points and hopes they’ll stick. They don’t. Instead, Twixt rambles and roams, all without any sense of direction. It waddles its way through its “plot” and hopes the audience won’t notice its lack of purpose, all as it feels a whole lot longer than its mere 88 minutes. This ends up as an embarrassment for all involved. Since I want to give Coppola more credit than he probably deserves, maybe I can convince myself he intended Twixt as a spoof of horror films. I don’t think so, but such a belief might help me more easily reconcile the awful quality of the end product. Twixt includes too much comedy for me to think Coppola wanted us to take it totally straight, but I still feel he hoped he’d create a chilling thriller. I don’t know how he could expect such a thing with the muddled mess he made. Random and pointless, it becomes tough to conjure positives about this project. I guess the actors give it their best shot, though they can’t do anything to redeem the project. It seems clear that Coppola did little to convey his intended tone, as the performances come all over the map. Some actors camp it up, while others play it straight. Some go for laughs, some shoot for horror. There’s no consistency and I get the impression Coppola left the actors on their own to decipher his intentions. Honestly, it’s disturbing to realize the same man who directed classics like The Godfather and Apocalypse Now could create something as utterly misbegotten as Twixt. Amateurish, cheap and pointless, this feels like the work of an untalented rookie, not a Hollywood legend. Twixt appears in an aspect ratio of approximately 2.00:1 on this Blu-Ray Disc. Though not stellar, the visuals usually satisfied. Sharpness mostly worked fine. I noticed a few slightly soft shots, but those remained infrequent, as the movie generally came across with positive clarity. No shimmering or edge haloes appeared, but some light examples of jagged edges could occur. Print flaws remained absent and I noticed no digital artifacts. As expected from a horror thriller, colors went down a heavily stylized path. Indeed, Coppola made some segments virtually black and white to highlight the use of bloody reds. Other sequences opted for a more amber feel. Within these parameters, the hues seemed fairly satisfying. Blacks showed nice depth, while shadows offered acceptable smoothness and clarity. This became a mostly solid presentation. With the film’s DTS-HD MA 5.1 soundtrack, we found an involving affair. The mix offered a fair amount of directional dialogue, and various creepy elements appeared around the room. These didn’t often stand out in a “slambang” manner, but they used the various speakers in an effective way and fleshed out the spectrum to create an eerie impression. Audio quality was good, though speech could be a bit of a weak link. Some lines used too much reverb; while this seemed to be a production choice, it gave those lines an “ADR feel” that distracted. Still, most of the dialogue showed natural tones, and effects appeared pretty accurate and dynamic. Music sounded cheap – as I’ve mentioned, this feels more like a basic cable film than I’d like – but the score showed reasonable reproduction. Nothing here dazzled, but the audio worked acceptably well. Only one significant extra shows up here: Twixt - A Documentary. 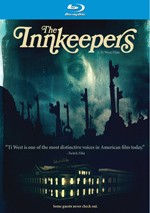 This runs 37 minutes, 42 seconds and delivers comments from writer/director Francis Ford Coppola. 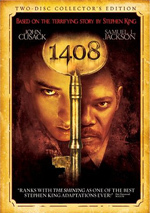 We learn of the film’s origins and development, story/character areas, and aspects of the production. Though we get occasional remarks, “Documentary” works more as a production diary than anything else, and it does fairly well in that regard. Made by Coppola’s granddaughter Gia, she inserts herself in the action a little too often, but she still gives us a nice view of the shoot. While not the most informative show I’ve seen, it works reasonably well. The disc opens with ads for Carrie, Stoker, Phantom and 12 Rounds 2: Reloaded. Sneak Peek also includes promos for A Good Day to Die Hard, The Americans Season One and Killing Lincoln. No trailer for Twixt pops up here. When I go into a film directed by Francis Ford Coppola, I may not expect greatness, but I anticipate something reasonably good. Unfortunately, 2011’s Twixt would seem like a dud if made by an under-funded amateur; to view something this cheesy and incoherent from a much-lauded filmmaker like Coppola comes as a shock. The Blu-ray provides generally good picture and audio along with a moderately engaging documentary. Twixt may not be Coppola’s worst film, but it’s gotta be close.